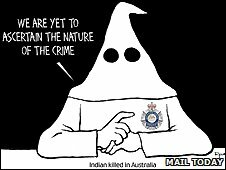 Australia has condemned as "deeply offensive" an Indian newspaper cartoon depicting the police as members of the racist Ku Klux Klan. India's Mail Today ran the cartoon showing a figure with an Australian police badge and a pointed white hood. It follows the murder of Indian Nitin Garg, 21, in Melbourne and a string of other attacks on South Asians. Australian officials say the attacks have not been racist, but random acts by opportunistic criminals. The cartoon in the newspaper portrayed a person in a white Ku Klux Klan hood with a Victoria state police badge and the words: "We are yet to ascertain the nature of the crime." The Victoria state minister of police, Bob Cameron, condemned the cartoon. "Victoria Police is a very tolerant organisation and Victoria is a very tolerant state and to suggest that Victoria Police is racist is just plain wrong," Mr Cameron said. Deputy Prime Minister Julia Gillard said she had not seen the cartoon but she said: "Any suggestion of the kind is deeply offensive and I would condemn the making of such comment." She said police in state capital Melbourne, where Mr Garg was murdered, had increased patrols in areas where violent attacks had taken place. The state's police union said the drawing was based on nothing but "a slow news day in Delhi". "Cartoons in Australia are normally done by people who are either clever or witty and this one's neither," the secretary of Victoria's Police Association, Greg Davies, told reporters. He said it was too early to say whether Mr Garg's murder was racially motivated and that it was "incredibly offensive and wrong" to suggest police were not investigating the crime. Mail Today editor Bharat Bhushan said the cartoon had been intended to provoke "introspection" among Australians about the nature of their society. "People in India perceive these attacks as racist, because their children are being attacked and killed. So it's good if Australia is getting agitated. The more agitated they get, the harder they will work to improve the situation," he told the BBC. The past year of attacks on Indian students in Melbourne and Sydney has made headlines in India and caused diplomatic relations to sour between Canberra and Delhi. The Indian government issued travel advice to students going to Australia after the murder of Mr Garg. The issue now poses a threat to Australia's lucrative international education industry. Australia has published figures indicating the number of Indians wanting to study in the country has plummeted by 46%. Australia's Tourism Forecasting Committee said in December that more than 70,000 Indians studied there in 2009, accounting for 19% of total international enrolments.